... many hands have made contribution to the Badderam proposal. Kim and Heidi thank each person for their knowledge, enthusiasm and professionalism. Owner, Visionary and Creative Director of Badderam Heidi Meyer aspires to transform the travel world! Heidi wakes up each day with the drive to prove that luxury and ecology can sit sustainably side-by-side. Her goals include redefining sustainable travel, making it more luxurious than ever before, rewarding guests with indulgences when they choose to tread more softly upon the earth and encouraging regional business to offer more sustainable products and services. Click here to read Mrs Heidi Meyer’s professional and life experience in detail. Buderim resident, Investment Director, Developer and Ambassador of this proposal, Kim Carroll moved to Buderim with his wife Mrs Heidi Meyer, to enjoy Buderim’s enviable views, cool breezes and a private acreage lifestyle surrounded by nature. Kim is passionate about Buderim and contributing to the ecological, economic and social sustainability of the Sunshine Coast region, a region he and his family have been a part of since Kim was eight years of age. Click here to read Mr Kim Carroll’s professional and life experience in detail. Has been involved in the hospitality industry for over 20 years and has held roles in an operational, consulting and development context. In Europe, Jude gained his consulting experience with TRI Hospitality Consulting in London where he worked on a large variety of hospitality development projects internationally. He subsequently joined Choice Hotels Europe as their Acquisition Manager and was involved on the roll out of select-service brands in the UK. In Australia, Jude and has held roles with DWS Hospitality Specialists and Jones Lang LaSalle. He operates across serviced accommodation and gaming sectors. Education: Post Graduate Diploma in Property Studies; Master of Business Studies in Planning and Strategic Management and Bachelor of Business Studies in Tourism and Hospitality Management. Gary has had a distinguished career in international hotel management, meetings industry management, hotel and tourism consulting services, tourism education and training. Gary is currently Owner/Director, Torphins Consulting. He is a leader in strategic human resource management and has held senior executive management positions with leading international hotels including Mandarin Oriental Hotel Group and Oberoi Hotels International. His expertise and career has spanned the globe, taking him to the United States, China, Russia, South Africa, Singapore, Indonesia, Fiji, Malaysia, Hong Kong, the Philippines, Taiwan and Thailand. He held the position of managing partner, PG International Consulting Pty Ltd for fourteen years, providing consulting services for the development of major convention, exhibition centre, hotel and tourism developments in Australia and internationally. Andrew is skilled in the facilitation and strategic planning of major projects. His extensive experience and involvement in the development industry has contributed to significant changes for planning and development across the state. Andrew is a respected member of the community and past-President of the UDIA Sunshine Coast. The depth of his engagement with Council and State decision makers ensures Project Urban's developments receive the highest level of consideration through the assessment process. Andrew is a Fellow of the UDIA, and has held Director positions with Matthew Flinders Anglican College and Sunshine Coast Grammar School. Andrew is a recipient of the Sunshine Coast Business Outstanding Business Person of the Year Award. A Director of the Project Urban Group, Kari has more than 20 years of experience in planning in both the private and public sectors. Kari has worked on a range of complex projects, including multi-storey towers, large mixed-use projects, retirement villages and childcare centres. Kari advises she is excited for Buderim and the greater Sunshine Coast Community regarding the economic, social, environmental and community benefits this proposal has the potential to bring about. An established Buderim resident and generous contributor to the Buderim Community, Gary is proud to have informed an expert team of professionals in making this exemplary ecotourism proposal. A senior Town Planner with more than 40 years of extensive experience, Gary has worked on a number of notable and prominent projects throughout Qld and NSW. “It is a rare opportunity to work on something so distinguished and ethical, I am excited for Buderim," Gary Dillon. Education: BSc Eng (Civil Engineering) MSc Eng (Design & Construction, Planning & Estimating), LG Eng, Certificated Town Planner. Joining the Project Urban Group in 2006 as a Senior Town Planner, John has a dedicated and thorough knowledge of the legislation and development assessment processes. John has worked in the UK and with the planning teams of the former Maroochy and Redland Shire Councils. He has worked with Kari Stephens throughout the extensive and detailed preparation of this development proposal. The proposal attributes to John, a well organised approach and appreciates John for the pertinent setting of team deadlines. Education: Bachelor of Environmental Planning. Known as the Sunshine Coast’s premier RPEQ registered Geotechnical expert, with over 30 years experience in his industry. Over more than 15 years, Geoff has undertaken more than 100 landslide risk assessments across Buderim and the surrounding region, and is often called upon by the Sunshine Coast Regional Council and other institutions to consult for them on this important matter. Geoff is the author of several published papers and a recipient of awards from both the Planning Institute of Australia and the UDIA. Geoff’s consummate expertise in the area of landslip hazard assures the proponents, future investors and the Buderim community, that the proposed site is suitable to support the proposed development. Education: BSc – Hons Engineering Geology, MSc Engineering Hydrology Registered Professional Engineer of Queensland (RPEQ 5716). A Senior Geotechnical engineer with 10 year’s experience, Simon is a Chartered Professional Engineer (CPEng) with the Institute of Engineers Australia and a Registered Professional Engineer of Queensland (RPEQ). Simon has worked on national and international mining and civil infrastructure projects for regarded employers Golder Associates, Coffey International and the Department of Main Roads. Simon specialises in geotechnical site investigations, foundation engineering, slope stability and landslide remediation. Simon’s experience and technical contribution to overseeing the fieldwork and laboratory results on this proposal have been elementary. Education: Bachelor of Engineering (Civil), Chartered Professional Engineer (CPEng), Registered Professional Engineer of Queensland (RPEQ 12476). Kevin is the Principal Engineer responsible for the privately owned consulting engineering company with offices in Maroochydore (Head Office), Gladstone, Rockhampton, Tamworth, Narrabri and Papua New Guinea. Kevin has more than 30 year’s extensive experience in Urban Development, Civil, Structural, Hydraulic, Fire Engineering and Project Management. The procurement of the Covey group as the Sunshine Coast’s premier engineers, coupled with Kevin’s leadership, add immense credence to this proposal. Education: BEng, CPEng, MIEAust, Registered Professional Engineer of Queensland (RPEQ 1823), MSPE, PONG, Grad. Cert. B.F.S. Chris is the Manager of the Maroochydore office of Covey Associates. He is a Structural/Civil engineer with experience in the appraisal, design and construction of the built environment in Australia and the United Kingdom. Chris brings over 20 years of industry experience, he has prepared the engineering services report addressing sewage and water reticulation, stormwater, traffic and transport, earthworks and electricity/communications. Chris has engineered solutions and given advice intrinsic to the success of this proposal. Education: BEng (Hons) Registered Professional Engineer of Queensland (RPEQ 4944). A certified professional in erosion and sediment control, Chris has developed stormwater treatment systems for a number of large scale development projects in Australia. He has been involved in stormwater research for 10 years’, commencing with his undergraduate studies at the University of the Sunshine Coast (USC). Currently, Chris is researching the potential for floating wetlands to be used for stormwater treatment in urban development and has developed the largest floating wetland research project in the world in partnership with USC. Chris’ industry based, experience is key and brings in-depth working knowledge to this project. Education: BEnvSc., BSc (Hons), PhD, CPESC. John is registered with the Surveyors Board of Queensland as a Cadastral Surveyor with an endorsement as a Consulting Surveyor. John undertakes involvement in a broad range of projects at a managerial and technical level in the fields of surveying and town planning. The proprietor until recently of Hinterland Surveying, John has contributed years of work relating directly to the proposal site and many other surrounding sites on Buderim’s southern escarpment. On board at the inception phase of this proposal, John’s ongoing contribution and experience are valued. Registered with the Surveyors Board of Queensland for more than 15 years’, Glen has worked for a number of firms throughout Australia and has gained extensive experience in a variety of areas. Glen now plays an important role on the Hinterland Surveying team and uses his collective knowledge on this proposal to ensure that all aspects of surveying are completed in a thorough and meticulous manner. With over 35 years experience in producing 3d imagery for award-winning architectural projects around the globe, Peter believes that “Vision is a commitment never to conform” ….Peter has created for the Badderam team architectural models, perspective renders and animations. Peter’s philosophy: “The system of the building design grid was established in the twentieth century. This system became popular throughout the world, as it allowed a huge amount of architecture to be built in a short period of time. However, it also made the world’s cities homogenous. One might even say that it made the people living and working there homogenous too. In response to that, over the last ten years, by modifying the grid slightly I have been attempting to find a way of creating relationships that bring buildings closer to their natural environment”. Founded in 1992, Williamson Architects has been involved in a range of commercial, residential, multi-purpose and industrial projects, both developer and own/user driven for over two decades. Brad is Master Architect for the Shuter Babuza Green Factory, Taichung/Taiwan (2015). Brad has headed the design of Audi Centre Brisbane (1998) receiving: RAIA Regional Commendation 1998; RAIA – The Commercial Award Highly Commended 1998; Australian Steel Awards – High Commendation 1998. Brad explains: “heroic architecture such as that proposed for Badderam, comes about, when there is coincidence of mind and emotion between client and architect resulting in something truly great”. Thomas joined Williamson Architects in 2009 as an international student. Thomas now has permanent residency and is a project design architect with WA. Thomas is the project architect for the Shuter Babuza Green Factory, Taiwan (2015). Additionally Thomas has spearheaded a variety of international architectural design competitions including: Instant House 2012 (Italy); Taichung City Cultural Centre 2013 (Taiwan); Varna Library 2015 (Bulgaria). A long established Buderim resident who owns a home in close proximity to the site, Rob has an in-depth knowledge and understanding of the site conditions. He has 19 years of industry experience in 3D CAD architectural drafting. Robs strong appreciation and respect for the local natural environment and his desire to preserve Buderim’s amenity, is reflected in his contribution to the Badderam site plan. Education: Advanced Certificate & Associate Diploma in Architectural Drafting. A life resident of Buderim, David has scrambled the southern escarpment of Buderim since he was a boy. David currently lives in Buderim and his architectural office was until recent years located in Buderim, directly above the proposal site. With over 30 years experience in designing socially responsible and sustainable buildings, David has made a contribution to this proposal with sensitivity to Buderim and the Buderim community in mind. Education: Bachelor of Architecture (1st Class Hons). Trevor moved to the Sunshine Coast in 1980 where he worked for several local firms before becoming a partner of Greenway Architects in 1990. Trevor specialises in multi-disciplinary architecture, design, documentation and administration through to final handover. He has worked on the design of many buildings including; the RACQ Care Flight Hangar and the Big Top Shopping Centre, an iconic building in its day. Trevor understands the microclimate of the Sunshine Coast and is committed to meeting sustainable design outcomes for the project. Trained as an Architectural Technician in Edinburgh, Mike Lennie worked for one of Scotland’s largest architectural practices for over 19 years. Since immigrating to Australia with his family in 1993, Mike has undertaken employment with various Architects on the Sunshine Coast, establishing his own Architectural Illustration business in Maleny in 2004. Mike has been auxiliary in producing 3D illustrations with the help of drone technology for this proposal to provide our design team with a greater understanding of the site aesthetic from multiple views and perspectives. Education: Self taught Architectural Illustrator. Sidonie is an awarded and revered Landscape Architect and Horticulturalist with over 20 years experience. As a founder and past president of Green Roofs Australasia 2008-2011, Sidonie has been responsible for leading the green roof and green wall movement within Australia. Sidonie has expert horticulture, construction and maintenance knowledge of such landscape features, essential when working in Australia’s unique climate. Sidonie has written the first Australian Green Roof Education course and has lectured locally and internationally on the subject. Education: BA (Architecture & Town Planning), Graduate Diploma Landscape Architecture, Cert III Urban Horticulture, Diploma of Fine Arts. Principal Landscape Architect at Project Urban with 16 years’ experience, Carl specialises in leading projects from conception, to design and approval, through to tendering, construction administration and supervision. Inspired by the diversity and richness of nature Carl seeks to compliment and strengthen local ecosystems and biodiversity through his design and plant selection. He believes that by creating synergies between nature and design we can produce locally supportive, sustainable and beautiful landscapes for the enjoyment of all. With 15 years experience as an Environmental Scientist, Josh specialises in the delivery of precise environmental investigation, assessment and subsequent reporting. Josh has been instrumental in working with the design team in reducing the environmental impacts of this proposal. Josh has protected the site’s flora and fauna and preserves the site’s ecological systems. Education: Bachelor of Science in Australian Environmental Studies, Ecology, Land & Water, Pollution and Health. An expert in sustainability for over 30 years, John has been an advocate for many environmentally conscious communities. As a designer, educator, builder and environmental consultant, he has worked to encourage communities to take responsibility for environmental delivery. Through his work in Australia and Europe, John has been recognised and honoured by the Government, building associations and academia alike. An ongoing relationship with Eco Lateral is envisaged across many years’. Education: Bachelor Business, Diploma Architecture, Graduate Certificate in Carbon Management, Master of Environmental Science (current), Water Efficiency Assessor, Green Star Accredited Professional, Enviro Development Professional, Registered Designer and Builder (BSA 80017), Qld NCC Expert in Energy Efficiency, Liveable Australia Auditor. Principal Consultant at Eco Lateral, Eliza has over 10 years experience in the architectural and building industries. She has worked on a wide variety of projects in the domestic and commercial sectors in Australia and Europe, and her holistic experience brings an important dimension to the services provided by Eco Lateral. Eliza is dedicated to promoting environmental principles to all sectors of the building industry as a means to improving the quality of all environments. She brings together integrated sustainability knowledge and essential technical expertise. Education: Bachelor of Architecture (Hons), Master of Environmental Management in Sustainable Development, BERS Assessor, Green Star Accredited Professional. Graeme has been a passionate environmentalist from a very young age. Growing up on a farm he was fascinated with nature and was always determined to play his part in sustainable development. He has owned numerous waste management and recycling companies in the UK. He was one of the founders of the award winning waste management company, 707 Resource Management, in the UK. He currently works with Council and Government bodies. Graeme has set a target for this proposal to become the first zero waste resort in Queensland and one of only a handful in Australia. Education: Bachelor of Environmental Management. Brendan is a qualified Arborist, Tree Surgeon and Horticulturist. Brendan has been instrumental in surveying and documenting established trees, canopies and root systems on the site to ensure their preservation. He worked as a SCRC Arborist from 1993 to 1996. He is a professional Member of International Arborists Association, Australian Arborists Association and the Queensland Arborists Association and has been operating on the Sunshine Coast since 1985. Brendan is the Director and Consulting Arborist with Tree Solutions which was established in 1999. Education: Hort Cert, Diploma Arb. Adam is an RPEQ registered engineer with more than 25 years of experience in transport planning and traffic engineering, both in technical and management roles. He has worked for Queensland Department of Main Roads and specialises in traffic impact assessment. He has completed numerous traffic impact assessments for retail, commercial, and industrial uses. Education: ssociate Professor School of Civil Engineering, Bachelor of Engineering, Masters of Engineering SC, Graduate Diploma in Technology Management. Registered Professional Engineer of Queensland (RPEQ 5286). Chris has significant expertise in traffic engineering and assessment. Chris has used his specialist knowledge in this proposal regarding the master planning of new developments, as well as transport network studies, parking studies, site access and layout design, traffic management plans, servicing management plans and intersections analysis. Chris has contributed multiple detailed analyses, more than is usually required, to make certain that this proposal has minimal negative impacts for the Buderim community. Education: Bachelor of Commerce Hons/Bachelor of Science – Management Science and Information Systems/Environmental Science/Statistics, Masters of Engineering. Specialising in environmental noise and soundscapes, David has worked as an Acoustic Environmental Scientist for over 30 years. Throughout his career he has advised local authorities as well as State and Federal Government departments. His wealth of experience has contributed elementary environmental noise level impact assessments and outstanding acoustic advice to this proposal. He has focused on protecting the environment and amenity of neighbouring properties with his advice. Education: Certificate of Technology – Building, Diploma of Applied Science (Environmental Health), Bachelor of Applied Science – Biology (with Distinction), Member of Australian Acoustical Society. Grant is a business development specialist and management consultant with more than 30 years Chartered Accounting experience. Grant specialises in high growth private businesses/ventures and providing solutions to the vast challenges they face. Grant has significant experience providing financial and feasibility advice. His financial advice, estate planning, taxation planning and vast experience in Shareholder Value methodology, are considered valuable to this proposal. Education: Bachelor of Business, Graduate Diploma in Advanced Accounting. Zee Zhang brings significant business advisory experience to this proposal. With more than a decade of experience across a number of industries, he caters to the wealth development and management of varying organisations and businesses. He has significant experience in helping businesses to assess their financial performance and understand the opportunities and limitations for growing their business. Zee also has applied his experience working on feasibility studies and surveys to this proposal. Education: Bachelor of Commerce, Bachelor of Information Technology, Graduate Diploma of Chartered Accounting. Jackie Smith has over 20 years experience, in advising a broad range of clients including include high net wealth individuals, independent investors, entrepreneurs, small to medium enterprises and superannuation fund trustees. She has a particular interest in presenting and employing common sense strategies and tools to maximise returns for business/investment stakeholders. She has also worked with Grant Field and Zee Zhang on various feasibility scenarios and the financial modelling of this proposal. Jackie has applied her practical experience and emotional intelligence to this project. Education: Bachelor of Business, Graduate Diploma CPA Program. James has nearly 30 years experience in property development, management and advisory services across most sectors of the industry. For this proposal, James provides development feasibility advice to the proponents while at the same time offering pragmatic and insightful guidance as to how to create a well-managed project, with excellent outcomes for Buderim and the greater Sunshine Coast community. James has consulted to the Department of State Development, Queensland Transport, Stadiums Queensland, the Mater Hospital and local regional Councils providing development commerce and economic advice on major urban projects. Education: Member of the State Governments Board for Urban Places. Committee member of the UDIA and PCA in Queensland. With more than 20 years experience in economic consulting and market research, Kerrianne has extensive experience in the preparation of centre development strategies, master planning input, economic strategies and highest and best use analyses. She has worked with local and state authorities and has been instrumental in producing the consummate economic and community benefit statements associated with this proposal. Education: Bachelor of Economics, Diploma in Market Research, Certificate in Market Research. Joshua is an ‘experience collector’, driven by the opportunity to undertake a broad range of projects across Urban Economics’ spectrum of services providing exposure to a variety of economic consulting within the property industry. He has undertaken research and data gathering for this proposal including investigation of active 5 and 6-star hotels and brands as well as the competitive supply network. He has been responsible for economic turnover and employment impact modelling. Education: Bachelor of Business, Diploma of Information Technology. Andrew specialises in planning and environment law. Prior to joining P&E Law in 2007, he was employed as an Associate to a Judge of the District and Planning and Environment Courts. That experience gave him exposure to leading practitioners conducting P&E Court proceedings, prosecutions and general civil litigation. Education: Bachelor of Laws, Bachelor of Business, Graduate Diploma of Legal Practice, Diploma of Business, Legal Practitioner of Supreme Court of Queensland, Legal Practitioner or High Court of Australia. With more than 17 years experience in law, Matt is an expert in native title and Aboriginal cultural heritage law and is experienced in dealing with and acting for Indigenous groups. He regularly advises local governments, developers and submitters in planning and environment matters. Education: Bachelor of Laws, Bachelor of Arts, Legal Practitioner of Supreme Court of Queensland, Legal Practitioner of Supreme Court of New South Wales, Legal Practitioner of High Court of Australia. Jane is a paralegal with experience in intellectual property, in particular, trade mark law. She is experienced in full service trade mark prosecution in Australia and internationally, as well as infringement and passing off claims. Jane provides advice in relation to trade mark protection strategies and development of new brands, related domain name and business name protection advice and registration, as well as centralised world-wide trade mark portfolio management. Education: Member of the International Trade Mark Association. With over 15 years experience in customer strategy, sales and marketing within the media, hospitality and tourism industries, Michelle is well versed when it comes to leading business initiatives across consumer and technology streams and facilitating operational, organisational and digital change to support the delivery of key business objectives. Her knowledge of the leading social media channels, digital marketing and online retailing is extensive. Michelle brings her creative prowess and extensive media marketing oversights to the Badderam website and the proposal’s marketing as a whole. With a background in investment banking working for leading firms JP Morgan and Goldman Sachs, Matthew moved into IT in early 2000. Since then he has worked on numerous high traffic websites such as, Whereis.com, Yellowpages.com.au and Whitepages.com.au. In 2006 Matthew was asked to join the founding team of shopping search engine Lasoo.com, where he worked as General Manager of Product and Marketing. He left Lasoo in mid-2011 to start his own digital agency, socialtap.com.au. With a degree in IT, majoring in information systems, Matthew brings his extensive experience in online marketing and website development to the Badderam project. Education: Bachelor of IT majoring in Information Systems, Certificate IV in Workplace Training and Assessment. At the forefront of technology, Graham delivers knowledge and technical support specialising in system configuration, installation, preventative maintenance and networking. Operating since 2009, Sunshine Coast iT uniquely delivers onsite computer services to residential and business clients across the Sunshine Coast and Hinterland region. As a talented young entrepreneur and resident of Buderim, Graham looks forward to the business and economic opportunities this eco resort proposal creates for small business on Buderim. Education: Bachelor of Business (Human Resource Management & Marketing), Certificate IV Website Development, Certificate IV Networking, Network & Systems Administration Diploma. April Ford has spent majority of her life in marketing and sales management; with a strong focus on property across multiple markets. With an insatiable appetite for innovation, April Ford and her team spend their days analysing complex problems and developing digital solutions to reinforce and compliment their clients mission and values. April and her team developed social media content strategy for Badderam, working closely with Heidi, the Creative Director, to portray the future luxurious experience available at The Badderam Eco Luxe Resort & Spa. Having previously worked as the sole designer for three nationwide printing and distribution companies, we proudly welcome Larissa’s experience, talent and tenacity to the Badderam team. Larissa brings excellent graphic design, web and social media skills to Badderam. She is responsible for building Badderam’s new website and has helped with the design of new investor marketing material required, as we enter Badderam’s Capital Investment phase (Phase 2) Larissa will strategise effective social media and marketing engagement for Badderam going forward, helping us to continue connecting with the Sunshine Coast community and importantly now with operators and capital investors. Brian has worked in Design Studios and Advertising Agencies in London and Sydney, before moving to Buderim where he started his own Digital Marketing Agency. He has a demonstrated history of Lead Generation, is skilled in Search Engine Optimisation (SEO), Social Media Marketing and Web Design. Brian reports that he gained immense satisfaction working with Heidi and the Badderam team. 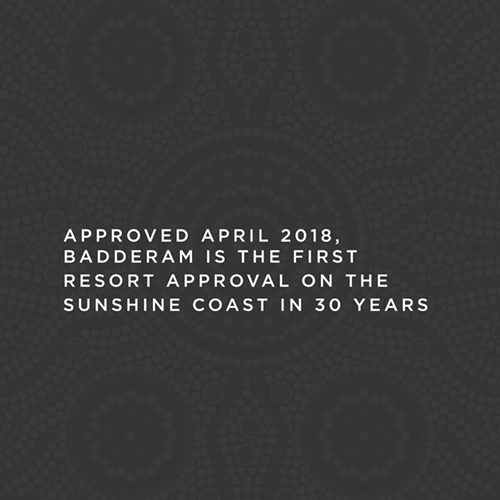 Reaching out to the Sunshine Coast community to inform of the values and benefits that the Badderam resort will bring, in a short timeframe, was always going to be a challenge. Working as a team, with complex digital marketing strategies, as well as using more traditional forms of printed media, extraordinary results were achieved.